Remember this song? Let's see...I'd renovate our current house, go on a much needed warm, tropical vacation, do a MAJOR Target run, buy a pontoon boat, and finally build a huge pantry off my kitchen and stock it full of goodies. Since I don't have a million dollars, I guess Million Dollar Spaghetti will have to do. I've made this before, do you remember? But, it's been awhile, so I thought I'd share again. What I love best about this recipe is, that is makes a lot. So, I divide it up and put half in a dish to freeze for later. 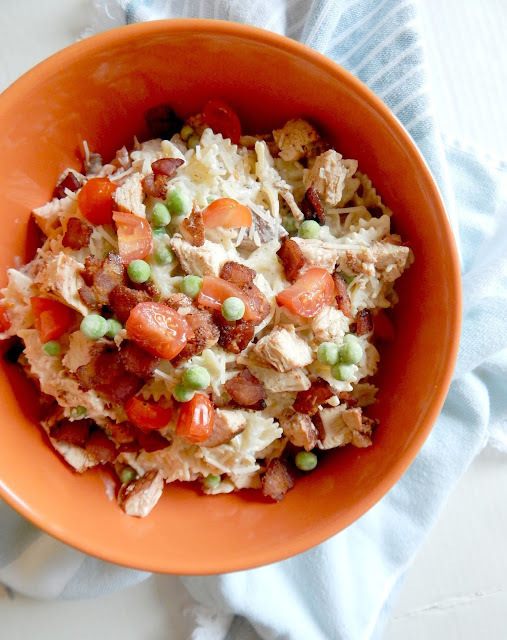 To all you moms out there, this dish is a crowd pleaser, and who just doesn't love pulling something out of the freezer in the morning and then throwing it in the oven when you get home? All the prep work is done. Cook spaghetti and drain, set aside. 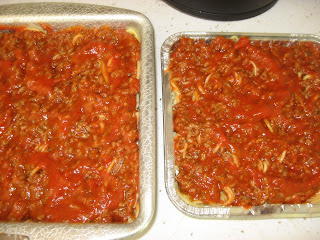 Saute ground meat and onion, drain and add spaghetti sauce. Combine cheeses, sour cream and garlic salt, set aside. 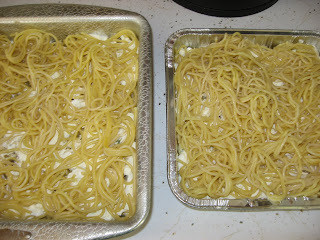 In two 8x8 baking pans, greased, spread half off the spaghetti noodles, cover with cheese mixture, and add remaining spaghetti. 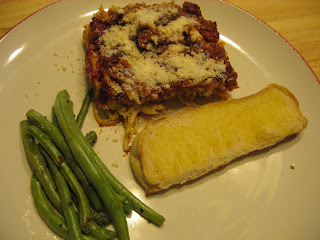 Pour melted butter over spaghetti (I omitted this), and then spread meat sauce over top. Today, I'm off for my walk with the little man and a friend. Then back to the kitchen to prepare for tomorrows farmer's market. Oh, this looks delish! It would totally be a hit at our house! YUM!! Your little one is so cute! It's amazing the ways that they fall asleep sometimes! The spegetti looks awesome. Good job. To answer your question from yesterday - i'm on mat leave in 6 weeks! WHOOHOOO! And probably not coming back..shhh...not really a secret, only from work for now. I'm pretty certain I'm goign to get to stay home, be a mom and a farmer. heaven to me. As soon as I read the title of this post, that song started playing in my head. Now it's stuck. Good thing I like it! If I had a million dollars, I would build my dream house, and travel. A million doesn't go so far these days, as it did when that song came out!! HA!! doll baby :) the spaghetti looks so great! Thanks for the great recipe!! Hubby will love that! I love that picture of your son in his crib, so cute! I can remember when my oldest son (who is now 14!) 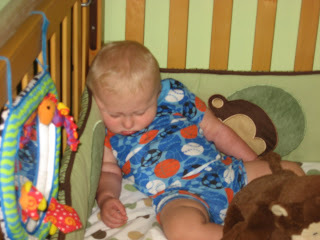 when he was about that age, putting him in his crib so I could put groceries away or check on the laundry, put some toys in there so he could play and I would come back to get him a few minutes later and he would be sound asleep!